Hope you are all staying cool out there during this mid-August heat wave! Although the light is changing and the fruits are coming in, it is still sweltering out there and your farmers are doing their best to keep both their spirits and plant's spirits high. Ahhh august, the time to tube the river, visit your county fair, and pick fruits and vegetables until your back is sore. The wild kingdom is really starting to close in on the farm these days. So much so that we are starting to take prisoners. Your gentle farmers are now true Americans, driving around in their pick ups with their shot gun...blanks only...in a desperate attempt to scare away the deer. One audacious individual has taken to bedding down, right in the middle of the day, in our tomato tunnel, snacking as she pleases on whatever ripe fruit is near by. Mosquitoes and wasps abound. There are baby rabbits everywhere we look, eating the bottoms of beans on the plant as well as stray ones that slipped through the wash cracks. I see adults, meeting for a midnight rendezvous in the lettuce patch. I can imagine what they are saying in rabbit-speak..."Oh Hey, you live here too? Isn't this place great? So much food and hardly any foxes...I know this great little hang out over in the beans, I'd love to see you again, maybe next week we meet up and, uh..." Farmers wear many hats, I think it is time to find an Elmer Fudd model and take back the farm. Delicious fruit abounds on the farm these days. The combinations seem endless (as does the picking). 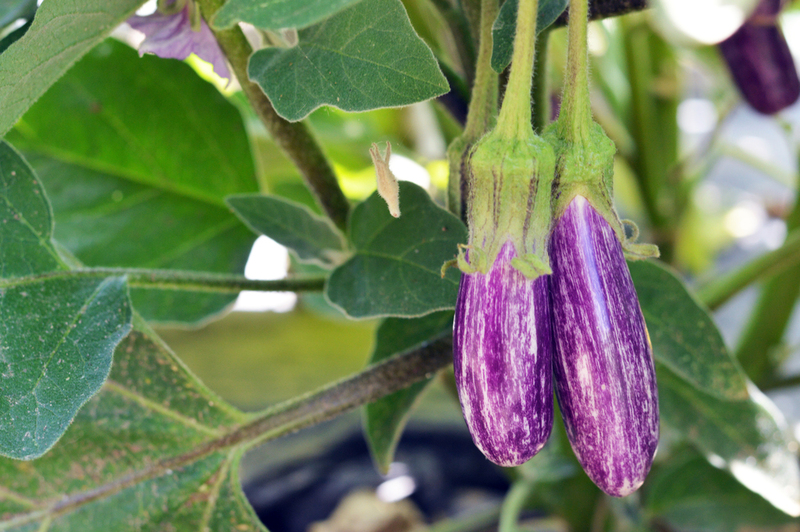 Eggplant makes a great substitute for meat. It's texture and innate ability to hold flavor will keep you feeling satisfied and packs a punch for any summer meal. Not feeling up for Eggplant parm in the oven? Try it on the grill. We have chopped it fine and threw it in a skillet with some gyro spices. Add some shredded carrot, tomato and tzatziki and serve with pita bread. Baba ganoush is another favorite. I like to char it whole on the grill and then scoop out the insides for a nice smokey flavor. make a big batch, it freezes well and is a crowd pleaser in the winter. Need a side for a pot luck? Roasted tomato and barley salad has been our go to as of late. Slice tomatoes and roast at 400 for 20 minutes with feta and olive oil. Cook the barley and combine with roasted tomatoes, add diced cucumber, olives, artichoke hearts, basil or whatever herbs tickle your fancy. Grilled caprese wrapped in a chard leaf is also a fun way to stay out of your kitchen. Get rid of the chard stem and steam the leaves ever so slightly. Lay them out and place a slice of tomato, a piece of good mozzarella, and a basil leaf in the center. Roll them up, sprinkle with olive oil and salt and grill them until the cheese gets gooey. Beer or yogurt battered beans are delicious when fried. Just sayin. Red Potatoes are being stubborn, taking longer than we would like but you can't rush perfection. sigh. A few FYIs for mid-August! 1. Winter Shares are going fast! If you would like one, please sign up within the next month. I am starting a list of folks that are interested in splitting a share, so if you need a buddy, just email me and I will try to get folks connected. You can sign up online or just bring the payment to the market. They are $500 for 22 weeks, pick-ups are every-other-week at Equinox starting in early November. 2. We will start to have bulk tomatoes here in the next few weeks. Look for slicing tomatoes and heirlooms starting on Saturday with romas coming in hot in the next few weeks. We will also have pickling cucumbers towards the end of the August, so be sure to get your canners ready! 3. Our awesome farm crew is sticking around for another year (hooray!) and our gal Grace wanted me to pass on some house-sitting credentials to you fine folks. If anyone needs some house or pet sitting services this winter, she is your gal. With over four years of pet sitting and house sitting experience, she cares for pets as if they were her own. She is accommodating to their specific needs, keep a clean house and can to provide references if needed. Feel free to contact her at graceeperry0004@gmail.com to chat more. It's time to put food away!